Cold Cream Emollient Cleansing Gel is a gently cleanses as nourishes dry skin. 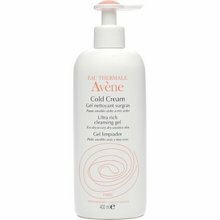 Formulated with nourishing cold cream to enhance the skin s protective barrier and Avene thermal spring water to soothe and soften. Soap-free. Suitable for infants and adults. Hypoallergenic and noncomedogenic.